LITTLE RIVER, SC – At the bag drop a hospitable attendant/starter shared that the Valley at Eastport might just be the most challenging short course we’ve ever played. He was absolutely correct. This Par 70 course is short at 5903 yards from the Blue Tees with a 68.4/127 USGA rating and slope. White Tees measure 5483 yards and 66.2/122. The Gold Tees are only 4937 yards with a 63.8/119 for men and a 66.2/121 for women. The Red Tees measure 4125 yards, 65.9/115. There are a few things you’ll need to know about The Valley at Eastport. Only two Par 5s account for the lack of length, Par 70. The fairways are narrow. From the tee box choose the clubs you accurately hit 200-225 yards. The greens are small. If you’re not hitting short iron approach shots with accuracy, you may have some problems. Only a few were tiered and they all roll very nicely. The course was in good condition for a mild December day. Green side sand hazards are large, deep and as good as any in the Myrtle Beach area. The course is not well marked. Take a moment to drive forward and see exactly what’s in front of you. There are a few hidden surprises. There’s not a driving range on-course, but there is one directly across the highway from the entrance. The putting green is indicative of what you’ll experience on the course. The Par 5s are each straightforward and provide an opportunity to score well, but remember there are only two. Hole 6 has water that goes into the fairway from the left and does come into play. Avoiding the water to the right brings a large tree into play that protects the green. On the back nine Hole 12 is narrow and requires an approach shot to an uphill green. Both Par 5s exceed 500-yards from the back tees, but require more accuracy than distance. The Par 4s really capture the character of this golf course. With the exception of Holes 9 and 18, length is not really the challenge, or so you think. Case in point is Hole 8 at a seemingly harmless 350-yards and a fairway that’s as wide as you’ll see on the course. Avoiding the fairway traps on the right and being in the short grass gives you a clear approach to the green. Be certain to select enough club to clear the large, deep bunkers that protect the front of the green. The Par 4 #14 could very well be the signature hole at The Valley. From the elevated tee your drive will need to carry considerable water and a tree lined fairway to make the turn on this dogleg left. If you’ve gotten enough drive on this 372-yard challenge, you’ll be left with an approach to a severely tiered green. Being on the wrong tier brings 3-putts into play. Holes 2, 5, 9, 11, 17 and 18 add to a really good set of Par 4s. The Par 3s are all quite playable, but par is a good score on each. 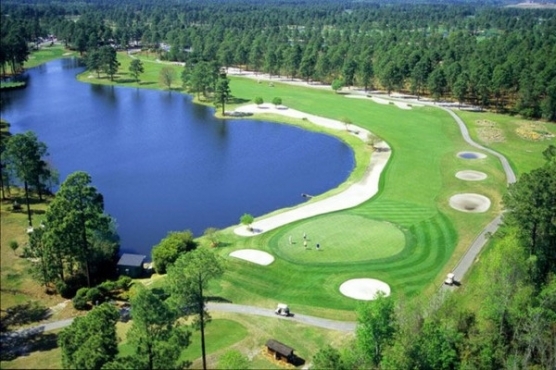 Choose your club wisely on Hole 4 and be cautious of water approaching the right side of the green. Hole 7 gives little room for error as trees protect the left side and sand traps wait to capture a timid tee shot to the right. Both Holes 13 and 15 bring water and significant sand hazards into play. Both are outstanding holes and visually quite attractive. When first assigned The Valley at Eastport and looking at their web site, I was not excited. The course had gone through some hard times and experienced ownership changes. However, my thought was I could find something good about any golf course. I was very pleasantly surprised. The Valley at Eastport is a really good test of golf. The guys that rip it can go long, but they better go straight. The guys with the shot making best bring their “A-game” to these small, well-protected greens. And every players needs to be on top of their sand game. This is a very affordable golf course that will test your entire game and likely ask you to use every club in your bag.